LONDON (VIP-NEWS) — UK festival Sonisphere, which was set to take place at Knebworth Park, between July 4 – 6 has been called off by organisers apparently due to difficulties securing acts. “Team Sonisphere reluctantly confirm that Sonisphere will not take place in the UK in 2015,” says a statement on the festival’s website. “We’ve been working hard to get a line-up that we felt was good enough but also on a weekend which would avoid other events that we know rock fans would want to support. Unfortunately our last irons in the fire have just been extinguished and it’s clear that we won’t be in a position to run the event this year. We’ve said in the past that Sonisphere will only go ahead if we feel it is going to be good enough and that hasn’t changed. 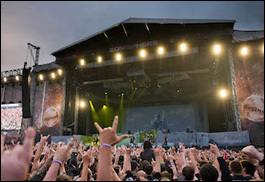 Sonisphere 2012 was similarly cancelled, in a year that took a number of festival casualties, often due to the impact and increased competition from the London 2012 Olympic Games.